As pervasive computing technologies leave the labs, they are starting to be used for the purpose of advertising. Pervasive Advertising has the potential to affect everyone’s life, but it seems that a knowledge gap is preventing us from shaping this development in a meaningful way. In particular, many marketing and advertising professionals have an expert understanding of their trade, but are unaware of recent advances in pervasive computing technologies, the opportunities they offer, and the challenges they pose. Similarly, many pervasive computing researchers and professionals are on top of the recent technological advances, but lack basic marketing and advertising expertise and therefore an understanding of how their technology can influence these fields. 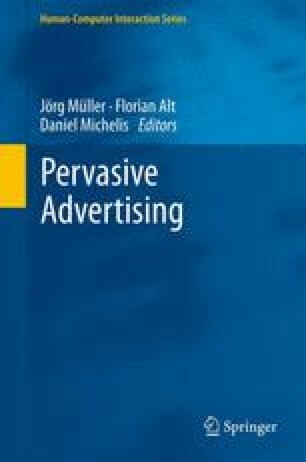 This book is intended to close this gap and provide the means to meaningfully shape the future of pervasive advertising. We would like to thank Albrecht Schmidt, Bo Begole, Aaron Quigley, Antonio Krüger, and our colleagues from Deutsche Telekom Laboratories for their support. Furthermore, we are indebted to all participants of the pervasive advertising workshop series for their contributions to the field. The research that led to these results also received funding from the European Union Seventh Framework Programme (FP7/2007–2013) under grant agreement no. 244011.